"A simple and basic recipe that gives anyone longing for New York's famous pizza something to truly enjoy! Add some flavor to your dough by incorporating seasonings such as oregano or garlic powder (1/2 teaspoon of each is more than enough). The dough can also be frozen for longer storage." Combine water, 1/2 cup flour, yeast, and sugar in a bowl; stir well and let sit until mixture is foamy and bubbling, about 20 minutes. Stir 2 cups flour, 2 tablespoons olive oil, and salt into yeast mixture using a wooden spoon until dough holds together; turn onto a lightly floured work surface. Coat the inside of a large bowl with 2 1/2 teaspoons olive oil. Knead dough, adding small amounts of flour as needed, until soft and slightly sticky, about 10 minutes. Form dough into a ball and place in the prepared bowl; drizzle about 1/2 teaspoon olive oil over dough and spread to coat entire ball. Cover bowl with a clean kitchen towel and place in a warm area of the kitchen until dough is doubled in size, about 2 hours. Punch dough down and place in a large resealable plastic bag; refrigerate 8 hours to overnight. When ready to use, remove dough from refrigerator and bring to room temperature before using. 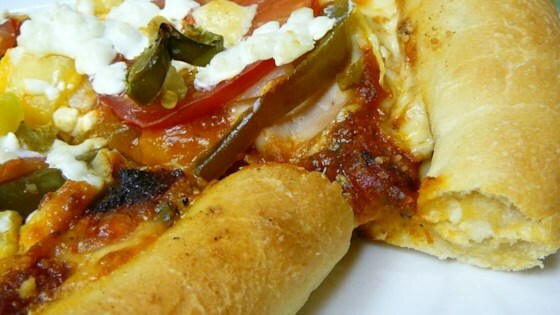 See how to make a gluten-free pizza crust! Bread flour is high in gluten and essential for a great pizza. You may substitute with all purpose flour if necessary but it won't turn out as great. When rolling out the dough, brush the edges with melted butter, prebake it at 425 degrees F (220 degrees C) for 8 minutes, add desired sauce and toppings, and brush the edges again with melted butter and finely minced garlic for extra flavor. Bake at 425 for approximately 15 to 20 minutes, or until crust is golden brown. Using a pizza stone that's very lightly brushed in olive oil for baking helps the bottom brown and get a crispy texture. Left the recipe the same and couldn't be happier. It really taste like a good new York crust. Great pizza dough recipe. Loved the texture of the crust. Added garlic powder and only used 1 tablespoon of olive oil. Amanda-Rae is truly a genius. Just a fantastic pizza crust. dough is real easy to stretch, and makes a chewy, yet crispy crust. All I can say is thank you, Amanda Rae. Wasnt really happy with this one. Still searching.